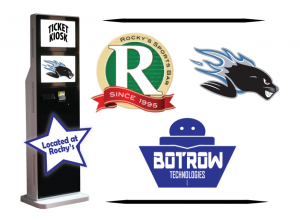 The Saint John Sea Dogs, a QMJHL team, have partnered with Botrow Technologies to sell game tickets at Rocky’s Sports Bar. Tickets can be purchased from the Self Serve kiosk for all 34 home games. There will be different promotions throughout the year to increase sales at the kiosk, from free wings at Rocky’s, to free beer at the game. Get out and purchase your ticket today! ← Crabbe Mountain Rolls Out Lift Ticket Kiosks!